I applied to the National Commission for Culture and the Arts' call for exhibit proposals last year. 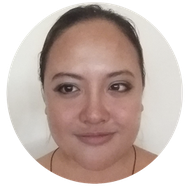 By January 2, 2015 I got my first good news of the year when Mimi Santos, Curatorial Director of NCCA, emailed me that my exhibit application was approved. 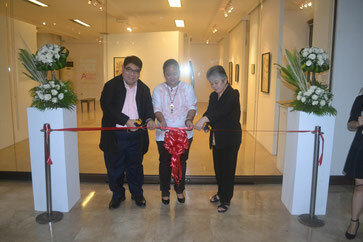 I was scheduled to exhibit at NCCA Gallery in Intramuros, Manila in October. 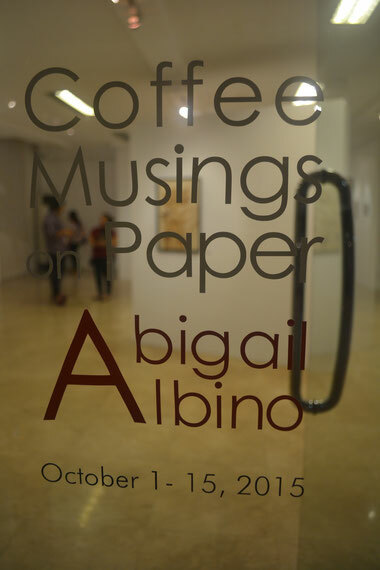 This coffee painting exhibit is in line with my thesis at the University of the Philippines - Open University. 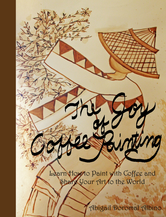 It's about Coffee Art in Communities, Social Media and the Art Market. 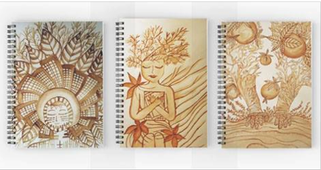 My year-long thesis produced a multimedia package about coffee art (including this website) and gauged people's acceptance with this type of art form. So basically this exhibit helped me gather thesis data (as a culminating activity) and made me progress in my journey as an artist. All throughout these months of preparation and project implementation, I realized that it was not just about exhibiting in the national commission's gallery. I started to realize that there was something more to this a couple of months before the NCCA committee heads came to visit me in Davao to check on the paintings. 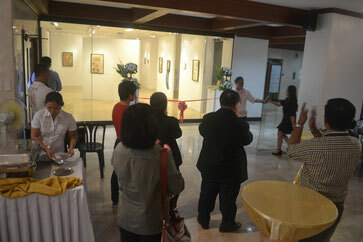 During their visit, I gave them a short tour around the art spaces in Davao (Ponce Suites, Davao Museum, and Silingan). They also got to meet and talk to some Davao artists and creatives at Silingan. It was an opportunity for our national commission to see the current state of the art scene here in Davao. I'm also glad that Sir Delan Robillos (NCAG Head) got to meet the people of Silingan so that they could be involved in the committee on galleries. 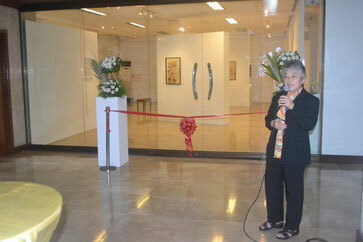 I went through depression all throughout the two months before the exhibit opening. I questioned myself a lot regarding my worth as an artist. Questions like "Am I really worthy to exhibit at the nation's capital?" and "Are my artworks even good enough?" pierced like vinegar poured into my soul's wounds into my soul. I think I've never prayed so hard in my entire life during the weeks prior to the opening. When the day of the exhibit came, it felt odd to me when I could no longer feel any fear. Maybe I already squeezed out all the anxiety I had over the past weeks. On the day of the exhibit opening, I attended mass at the Manila Cathedral (which is just a few blocks away from the NCCA Gallery). I felt an immense kind of peace all throughout the mass. 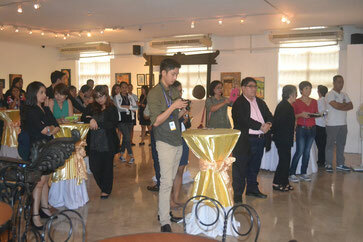 I prayed for the exhibit's success and that my sanity will be intact all throughout the event. By the end of the mass, the priest asked us to gather around the altar if we have any special intentions or would like to express our thanksgiving. It was the feast day of St. Therese Lisieux (October 1). The mass participants either kissed or touched the frame with St. Therese's picture near the altar. 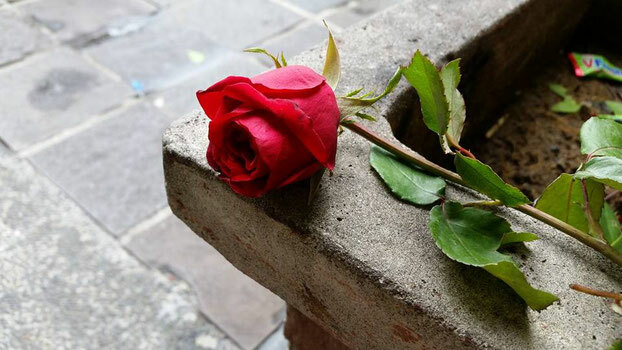 Then each one of us was given a stalk of rose. I left the church happy, not because it felt like a got a rose as a freebie, but I felt like God (and perhaps St. Therese as well) gave me a rose to celebrate this special day. It's like people close to you giving you flowers on special occasions. I did my opening speech without any anxiety. 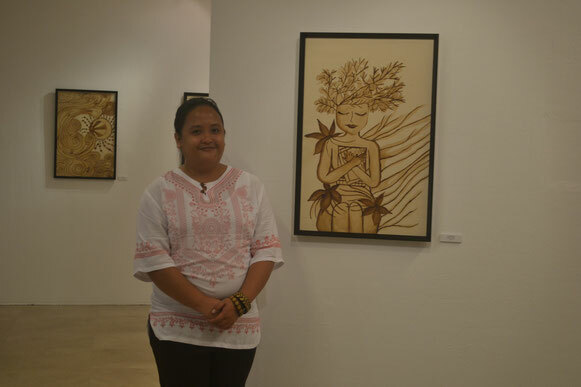 I think my speech was just less than 5 minutes as I shared about the concept of growth, specifically my growth as an artist in Southern Mindanao and how the Mindanawon spirit grows within me, through these collection of coffee paintings. I also made a conscious decision to enjoy the exhibit together with the NCCA staff and the young people who dropped by the exhibit. And I couldn't thank NCCA enough for making an excellent event. 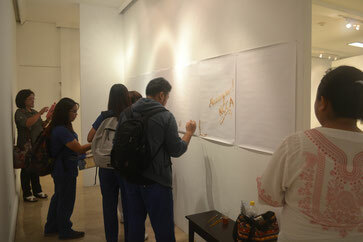 I made friends with the students and nurses who came to try their hands on the exhibit's coffee painting wall. I also met the people who, behind the scenes, preserve and promote our country's culture and arts. I had a heartfelt talk with NCCA's executive director, Adelina Suemith, who also hails from Davao. And yes, her house is just near our residence! No matter how simple these experiences are, they are like gems that I secure around my heart. Paint the wall with coffee! 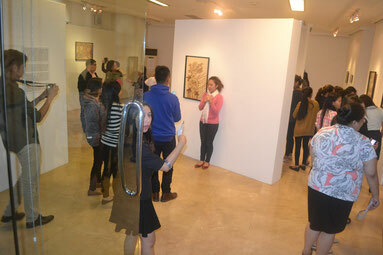 Thank you to all the people who participated in the opening! I got a lot of support from family, relatives and friends on social media. 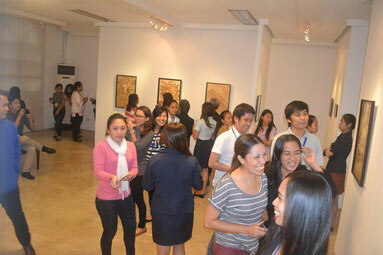 Most of them couldn't come to the exhibit since they are from Davao and the exhibit was in Manila. The NCCA exhibit also opened doors of opportunities for me, as I was invited to submit artworks at the Manila FAME event at HallOne and to conduct another exhibit at Tagaytay Highlands. And yes, speaking of Tagaytay Highlands, please help me accomplish this exhibit through my Patreon page. It would also be great if you prepare yourself physically. I did try dieting and exercising though, but my belly still showed through my white shirt during the exhibit. I still recommend that you prepare yourself fully so that you can present your best self during an important date of your life. I mentally, emotionally and spiritually prepared myself by reading inspirational books. I read Do Hard Things by Alex and Bret Harris, which I think is not only applicable for teenagers but also for anyone who would like to break out the mold of low expectations or the status quo. I also read Manuscript Found In Accra by Paulo Coelho, which is now my most favorite book in the whole wide world. The bits of wisdom found in this book (which is a transcript written from a talk given by a wise man before an upcoming invasion) are absolutely nourishing, uplifting and enlightening. I also read The Creators by Daniel Boorstin which opened my mind to the evolution of spirituality and artistry all throughout human history. And besides feeding my mind (instead of being engulfed by worries), I also prayed, went to mass, and asked for the support of my loved ones. I took regular walks to calm my mind. I also did a lot of journal writing to purge all of my fears and strengthen my resolve to go through with the exhibit. I wrote down all of my questions regarding the exhibit activities and emailed them to the gallery director weeks before the opening. Thankfully, Ma'am Mimi patiently answered all of my questions (which were organized in bullet points) so that our planning and communication would go well. I also felt relieved with so many issues when the gallery director and staff took care of the most crucial parts of the exhibit. There was also a little mishap before the day of the exhibit when they needed the details of the paintings (sizes, description, prices), and I was still in Cavite at that time. So with the convenience of an internet-enabled smartphone, I was able to resend the email that contained the files that had all the details about the paintings. Lesson learned: Keep all important documents about the exhibit on a flash drive or on your phone so that you can tap into them during emergencies. I listed down all the factors that are involved in the exhibit (paintings, descriptions, reception, participatory wall, etc.) and wrote down everything needed for each. I prepared these requirements one day at a time so that I wouldn't have to cram on the last minute. 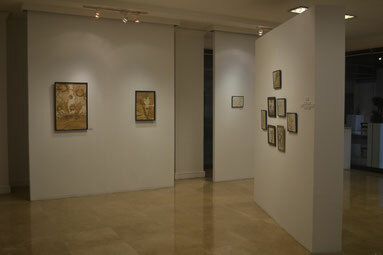 In the end I was a bit more relaxed before the opening and the rest were taken cared of by the gallery staff. I shipped my paintings to Manila 2 weeks before the event. It only took a few days for the NCCA staff to set everything up since all of the paintings and exhibit materials were fully prepared and contained in my wooden crates. If it's a bigger event, it pays to have everything on hand 4 - 6 weeks before the opening. I actually started promotions on a later date. I got the invites just a few days before the opening, so I wasn't able to give out invitations to as many people as possible. However, social media can really help you spread the word in this day and age. 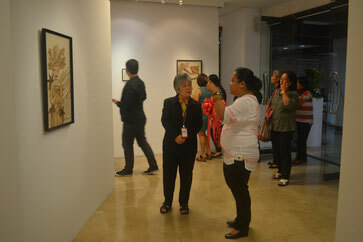 I was able to contact friends in Manila and inform them about the exhibit through Facebook. 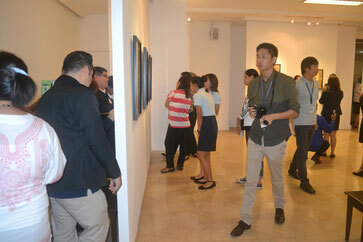 I also received other opportunities when people saw the exhibit's social media posts. After all the hustle and bustle of making sure that you come up with a great show, being grateful will give meaning to everything. 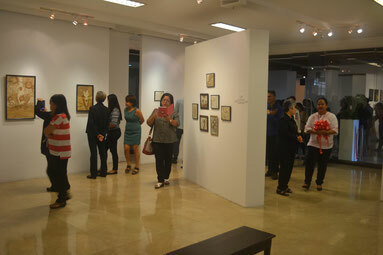 I made it a point to continually express my gratitude to the NCCA staff and to all the people who supported the exhibit. I couldn't have accomplished this without these people believing in me (usually more than I believe in myself). It was a turning point after six years of depression, and the boost that I needed to march on and pursue greater things. Yes, the last tip is actually not following the instructions told to us by our parents when we were young. I am usually the type of person who wouldn't talk if no one talked to me first. But talking to strangers will really help in promotions. The first people I handed out invites to were complete strangers (people I saw on shops and the staff on our hostel). 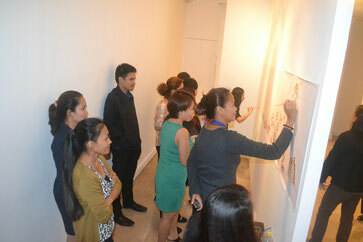 We were able to initiate the activity on our exhibit's participatory wall when we invited random students and professionals who walked by the NCCA Gallery. Goodbye, introverted artist. So that's about it. The year 2015 was a thrill because of my thesis activities, and with the culminating activity of the exhibit. This list of tips from my learning experiences is not exhaustive since every artist's circumstances may differ. 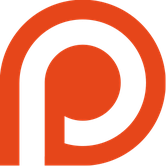 I hope it does help you in any way to prepare for art events or exhibits. If you have other tips or exhibit experiences, kindly share them below so that you can also help others.